After a grueling three days of tournament poker, the Full Tilt Poker Merit Cyprus Classic $25,000 High Roller Freeze-Out ended with Perica Bukara being crowned champion! The event began with a field of 36 players vying for the title. It was a mix of household names, talented pros and others willing to pony up the cash to let it ride in this event. Only nine made it to Day 3, all with their eyes on the top prize of $373,207. With only five players making the money, the pressure was on with every move, and the action kicked off with a blaze. Carter Phillips was first to exit after taking a painful beat on the first hand. On a board, Phillips held and had Andrew Feldman's in bad shape. Things quickly changed when the hit the turn and left Phillips drawing dead. He busted in ninth place a few hands later, followed by Ziv Caspi and November Niner John Dolan. Sam Trickett went out on the bubble, and once again it was a cooler. After playing for about three hours on the bubble, Trickett and Bukara got it all-in on a board of . Trickett held the for the second nuts, but Bukara turned the nuts with the . Trickett was not saved by the river, and bubble play was over. Jon Turner busted shortly thereafter and play was down to four. 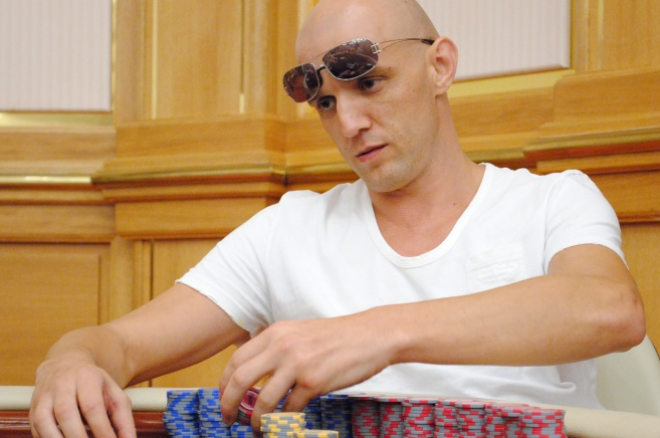 David Benyamine, chip leader from Day 1, succumbed to Bukara, as well, after a flop of . Benyamine ran into Bukara's and was not saved by the turn or river, bidding adieu in fourth place. For the next four hours, play remained three-handed with Bukara, Feldman and Ori Miller battling and doubling through each other numerous times. Unfortunately for Feldman, he was the one to miss out on heads-up play. After being down to one big blind and running his stack back up to a playable 17 big blinds, Feldman three-bet shoved into Miller's and did not improve, bowing out in third place. Bukara began heads-up play with the chip lead, but Miller battled back to hold it for most of the match. In the end, however, Bukara prevailed. This just seemed to be his tournament from Day 2 on. Bukara held numerous big hands and got lucky when he needed to, such as in the final hand. Miller raised on the button, and Bukara, with the slight chip lead, shoved with . Miller called with , but failed to hold up as the board ran out . Perica Bukara was crowned as the Full Tilt Poker Merit Cyprus Classic $25,000 High Roller Freeze-Out Champion, taking home a nice payday. The Main Event is still going on in Cyprus and the PokerNews crew will be on hand to provide all the live reporting coverage, and as always, follow us on Twitter for up-to-the-minute news. Right now you can qualify for Late Night Poker, the Poker Million, the Masters Series and the Full Tilt Series Espana exclusively at Full Tilt Poker.